Romana, short for Romanadvoratrelundar (/rəˌmɒnədvəˈrætnəlʊndər/), is a fictional character in the long-running British science fiction television series Doctor Who. A Time Lord from the planet Gallifrey, she is a companion to the Fourth Doctor. 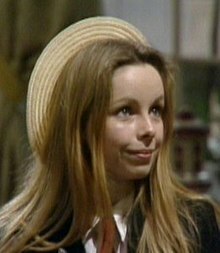 Romana is one of only two members of the Doctor's own race to travel with him in the original television series, the first being his granddaughter Susan Foreman (though the term "Time Lord" was only introduced after Susan's departure). Although Tamm had left the show on relatively good terms and was willing to film a regeneration sequence for the start of Season 17, she was not invited to do so. There was a rumour, purportedly started by former producer John Nathan-Turner, that the real reason Tamm left was that she was pregnant. Tamm has denied this repeatedly over the years. The introduction of Romana's second incarnation at the start of Destiny of the Daleks — a script credited to Terry Nation, but with several additions and alterations by script editor Douglas Adams — treats the concept of regeneration humorously; Romana changes bodily forms several times, rather like someone casually trying on different outfits, before deciding to take the form of Princess Astra, who had been played by Lalla Ward in the final serial of Season 16, The Armageddon Factor. This regeneration scene is controversial with some fans, as it does not conform the seriousness with which regeneration is presented in most other cases. It is generally presented as traumatic, even emotionally or physically agonizing. Attempts at rationalising Romana's regeneration have been made in licensed spin-off media, including the Short Trips short story "The Lying Old Witch in the Wardrobe" which speculates that the TARDIS was responsible for her regeneration. It has also been theorised that Romana may have needed to regenerate after being tortured by the Shadow in the previous serial, and that the different bodies she tries were merely projections. The second Romana enjoys a more intimate relationship with the Doctor than her previous incarnation, to the point that some fans have assumed a romantic relationship with the Doctor. Although a relationship was never explicitly shown or intended by the writers, many fans have found the signs of a romantic relationship particularly evident in the story City of Death, perhaps reflecting the real-life romance between Tom Baker and Lalla Ward which blossomed during the production of that story, leading to their brief marriage in 1981. In many ways, she might be claimed to be the companion most like her Doctor (if Romana I were not more like the Doctor than her) – besides being of the same race and comparable intelligence, she occasionally mimics his sense of style, wields her own sonic screwdriver and can occasionally get the better of him in moments of banter and more practical situations. As her practical experience develops, she also becomes more assured and capable in the situations she encounters. At the end of the serial Meglos, Romana receives word from the Time Lords recalling her to Gallifrey. The opening of the next serial Full Circle makes it clear that, having travelled with the Doctor, she no longer desires to return home. Before the issue can be resolved, the TARDIS falls through a "charged vacuum emboitment" and disappears into another universe known as E-Space. Her final television appearance was in the 1981 story Warriors' Gate where, along with the robot dog K9, she leaves to forge her own path in E-space when faced with a choice of remaining there or returning to Gallifrey. She also appears briefly in the 20th Anniversary special The Five Doctors through the reuse of footage from the uncompleted story Shada, as Tom Baker declined to film any new scenes for the special. In "The End of the World", the Ninth Doctor stated that his homeworld had been destroyed and that he was the last of the Time Lords. Whether Romana was killed with the others had not been specifically established on screen. Of note, while various spin-off material (see below) reveals that Romana later became President of Gallifrey after returning from E-Space, this is clearly not the case at the end of the Time War; in The End of Time (2009–10), the Time Lord founder, Rassilon (Timothy Dalton), is shown alive again and claiming the title. However, after "The Day of the Doctor", it is possible that Romana may still be alive as Gallifrey did not fall, but was instead sent to a pocket universe through the combined efforts of the first thirteen incarnations of the Doctor. Romana's time with the Doctor is also explored in several novels, which include additional adventures for her first incarnation when outside forces divert their efforts to find the Key to Time and general adventures for her second incarnation prior to departing in E-space. In the BBC Books Eighth Doctor Adventures novels, Romana undergoes a second regeneration, and her new incarnation (Romana III, whose appearance was modelled on silent movie actress Louise Brooks) is far less sympathetic and far more ruthless than the other two. This third incarnation pursues the Eighth Doctor in a story arc relating to the Future War, a War between the Time Lords and an as-yet-unidentified enemy, seeking to use his new companion Compassion – who has been unintentionally mutated into a Type 102 TARDIS in the aftermath of the destruction of the Doctor's own ship – as breeding stock for the new sentient TARDISes in the Future War. With the Doctor refusing to allow the Time Lords to make Compassion a slave, he, Compassion and fellow companion Fitz Kreiner go on the run between The Shadows of Avalon and The Ancestor Cell, the final confrontation on board the Doctor's believed-destroyed original TARDIS resulting in the obliteration of Gallifrey and the apparent retroactive wiping out of the Time Lords from history. A flashback in the final Eighth Doctor Adventures novel The Gallifrey Chronicles suggests that Romana is killed by Faction Paradox skulltroopers just before Gallifrey's destruction. However, it is hinted in Tomb of Valdemar by Simon Messingham that Romana may be one of a few Time Lords who survived this cataclysm, possibly in a fourth incarnation and The Gallifrey Chronicles itself suggests that the Doctor will eventually restore Gallifrey and all the dead Time Lords whose minds are stored in the Matrix, in time for its destruction again in the Time War. Romana II appeared pseudonymously in a series of audio plays produced in the early 2000s by BBV. In this series, Lalla Ward played a character who appeared with K9 in an unnamed parallel universe. This character is called the Mistress (which was what K9 called Romana in the television series). Because of an unusual copyright situation in which BBV was able to license K9 but not Romana or other Doctor Who elements, the Mistress is not explicitly called Romana. For similar reasons, the parallel universe (obviously intended to reflect Romana's exile in E-Space) is called a "pocket universe" in the series' packaging. In the audio series, Romana has to contend with the emergence of a terrorist group known as Free Time, which wants to break the technological monopoly on time travel and threatens not just Gallifrey, but its time travel-capable allies. Romana's progressive policies, including opening the Academy to non-Gallifreyans, also face opposition from more conservative elements. Complicating this is the escape of an ancient evil called Pandora from the Matrix in the paradoxical form of Romana's first incarnation (played once again by Mary Tamm). Both Romana and the Pandora entity proclaim themselves Imperiatrix of Gallifrey, provoking a civil war. At the war's end, Romana destroys Pandora by trapping her in the Matrix and destroying it. She is also removed from the Presidency. With Gallifrey on the brink of economic and social collapse, as well as in danger of being overrun by a Free Time virus, Romana and her friends flee through several alternate universes. Romana encounters many versions of Gallifrey worse than her own, before finally becoming trapped in one. This Gallifrey is similar, but without the ability to time travel. After their President Romana is assassinated, she assumes her identity, regaining her office, albeit in a different universe. She is eventually able to return to her universe with a cure for the Free Time virus, although the audios then lead into early strikes by the Daleks that are apparently intended to foreshadow the Time War. In July 2013 it was announced that Juliet Landau would play a future incarnation of Romana for Big Finish. This version of Romana was introduced in Renaissance, the third chapter of Gallifrey VI, released in October 2013, and was said to come from thousands of years in the future. This version of Romana was later reprised by Landau in the January 2014 audio drama Luna Romana, part of Big Finish's Companion Chronicles line; Landau also performs the role of Romana I in lieu of the now-deceased Mary Tamm in this story, the narrative intending to present Landau's Romana as looking back on the events of her first incarnation's travels with the Doctor. To avoid confusion with her earlier self, this future Romana volunteers to use the name Lady Trey (taken from one of the middle syllables of her full name). Landau returned to the role once again in Gallifrey: Intervention Earth, a continuation of the Gallifrey series released in January 2015. This story is revealed in the follow-up Enemy Lines to depict what happens shortly after Ward’s incarnation is forced to regenerate and sees Gallifrey on the brink of another war. However Irving Braxiatel prevents the regeneration so that these events, including the very existence of the Landau incarnation, are undone. In November 2013 it was revealed that Lalla Ward would reprise her role of Romana II alongside former Fourth Doctor Tom Baker and John Leeson as K9 in a pair of audio adaptations of Gareth Roberts Missing Adventure novels The Romance of Crime and The English Way of Death in January 2015, to be followed by at a series of new adventures in 2016 and another in 2017. There is no word yet if this will be followed by a third in 2018. Lalla Ward also returned as Romana II in Gallifrey: Enemy Lines in 2016. ^ Chapman, James (2006). Inside the Tardis: The Worlds of "Doctor Who". I.B.Tauris. p. 7. ISBN 978-1-84511-163-2. ^ "There's Something About Mary", a featurette in The Key to Time: Special Edition DVD box set (BBC Video/2 Entertain, 2007 – UK; 2009 – US). ^ Bernard, Marcus. "Doctor Who – Commercials". TVARK. Archived from the original on 28 April 2006. Retrieved 4 March 2007. ^ The Third incarnation of Romana has no audio or television actor as she only appeared in novels.